One thing you learn when you have a child, is that routine is extremely important. This is especially true during the toddler stage! It’s amazing how a clear, set routine can make a huge difference to your little one’s behavior. They love routine and hate for it to be broken. So, if you want to avoid the epic meltdown that will occur if the routine is changed, it can help to create a toddler schedule. Having a clear schedule which they can follow every day is surprisingly comforting to a toddler. It also allows you to teach them more about boundaries and gives them a great sense of security. So, how can you create a good schedule to keep you and your toddler happy? 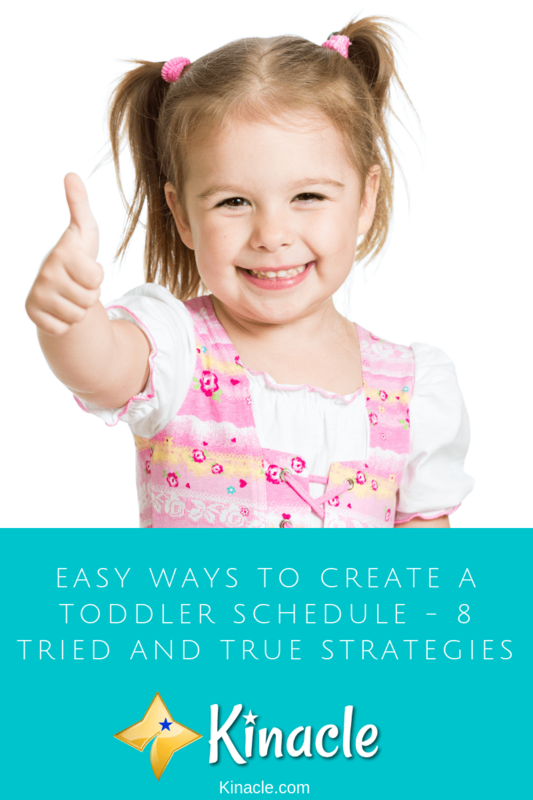 Below, we’ll highlight some of the easiest ways to create an effective, simple toddler schedule. When creating your toddler’s schedule, you’ll want to make sure it incorporates both theirs and your daily chores. For example, each morning you could serve up your toddler’s breakfast at the same time, then afterwards they can help you feed the dog. This combines two chores and creates a routine your toddler will look forward to. Try and combine as many daily tasks as you can, making sure you do them at the same time every day. The key is repetitiveness and your toddler will really thank you for it. When creating their daily routine, you’ll want to include a little outdoor play. Thanks to technology, kids today don’t spend half as much time outdoors as they used to. However, outdoor play provides so many benefits. It allows your toddler to explore, get some much-needed fresh air and aids in their development. Even if you just fit in a daily walk with your toddler, it gets you both outdoors and really helps to recharge the batteries. If you schedule the walk in so it’s not long before bedtime, you’ll also find it can really help to improve your little one’s sleep too. As with everything you put in the schedule, make sure you set outdoor play at the same time each day. One thing that’s going to make your life so much easier, is preparation. A lot of the time, your toddler’s routine can be interrupted due to you rushing around trying to get things done in a limited amount of time. However, if you’re prepared, it’s much easier to ensure their routine stays the same every single day. If you tend to stay up late, use it as an opportunity to prepare things for the morning after. It may seem like a chore, but the fact it could prevent an epic meltdown if your toddler’s routine is altered, makes it more than worthwhile! Similarly, if you get up super-early in the morning, you can use the time alone to make a start on the day’s preparations. Each day, you should ideally be making time for learning activities. While it’s possible to combine reading, arts and crafts, gross motor skills and fine motor skills activities, you may find it much easier to actually alternate them. This means, one day focusing on activities which boost their gross motor skills, then another day focusing on tasks which improve their fine motor skills. This makes it much easier to stick to the same routine every day. You can set the same time slot daily, with specific days reserved for different types of activities. For example, Wednesdays could be art and crafts day. Your toddler will start to look forward to specific days of the week when they know what they’re going to be doing. You’ll also want to fit in some independent play sessions into their schedule. Some toddlers will find this much easier than others. If you have a clingy toddler who prefers to spend their entire day practically glued to your side, this is going to prove pretty challenging. However, if you’re consistent and you make sure the independent play sessions are done at the same time each day, your little one will soon get the hang of it. Independent play isn’t just important for your toddler’s development, but it’s also going to prove really useful for you, giving you additional time to complete your own daily tasks. This is by far the most challenging part of creating a toddler schedule. Getting them to go to bed at the same time every night isn’t easy! However, the more consistent you are, the sooner they’ll get into a routine. The activities you’ve scheduled into your toddler’s day, will help to prepare them for bedtime. For example, as mentioned earlier, going on an early evening walk can help to tire them out, making them less likely to resist going to bed. Out of all of the tasks on their daily schedule, this one is the most important. When they don’t have a strict bedtime, they’re more likely to have behavioral issues during the day. A tired toddler is a grumpy one, so as difficult as it is, be strict with their bed time and ensure it’s the same every single night. There’s going to be times when sticking to your toddler’s daily schedule isn’t easy. Things go wrong sometimes, and emergencies crop up. The trouble is, in an emergency situation, your toddler’s schedule often ends up completely ruined. This in turn can lead to epic tantrums and months of problem behavior. So, it helps to have a back-up plan ready. Of course, you can’t prepare for every eventuality. However, you could have a basic emergency situation back-up plan. For example, you could plan ahead so that if an emergency does crop up, your toddler could go and stay with a relative or friend. You could provide them with the schedule, making sure they stick to it while your toddler is in their care. There may be some teething issues as just the change of scenery can be enough to disrupt your toddler’s behavior. However, having this plan in place will still minimize the disruption. The final tip is to ensure your toddler’s schedule allows for flexibility. So, rather than setting aside strict times that everything needs to be done, it’s best to create more of a window. You could set outdoor play sessions between 1pm and 1.30pm. Or, give your toddler’s bedtime routine a half an hour window just in case anything does crop up. If the schedule doesn’t allow for flexibility, it’s going to cause a lot of problems if unexpected things do pop up throughout the day. The above tips can help you to create a great toddler schedule. Just remember to allow for flexibility and to stick to it as closely as possible every day. Got any other tips which might help others to create a schedule for their little one? Share them below in the comments.